Voiced Keyboard can speak out the text you are typing at the completion of each character or word. 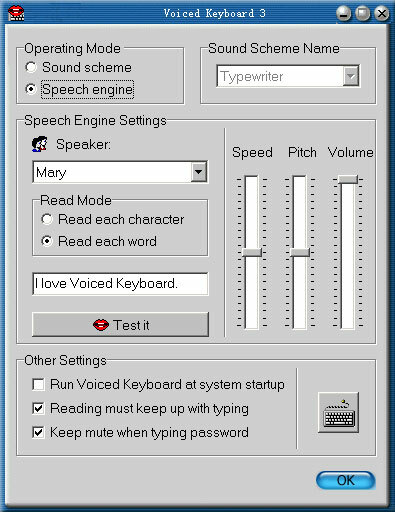 Using Voiced Keyboard means that you can touch-type and have your computer confirm that you have been typing without spelling mistakes. This, at the same time, can greatly improve your typing speed. ...... Another remarkable feature of Voiced Keyboard is that it can generate sounds at certain keyboard events in many different sound schemes (such as a typewriter, birds, insects, etc. ), which makes you feel in different environments and have fun. The newly released Voiced Keyboard 3 even includes free typing test and several other powerful tools. Enjoy it! Qweas is providing links to Voiced Keyboard 3.2 as a courtesy, and makes no representations regarding Voiced Keyboard or any other applications or any information related thereto. Any questions, complaints or claims regarding this application Voiced Keyboard 3.2 must be directed to the appropriate software vendor. You may click the publisher link of Voiced Keyboard on the top of this page to get more details about the vendor.